Pro Teck Valuation Services’ March HomeValueForecast.com Update explores the Turnover Rate (# non-distressed sales divided by the total housing stock in a region) as a simple yet powerful leading indicator of future home prices. This analysis demonstrates that home prices in many areas are already rebounding from the bottom of the market. 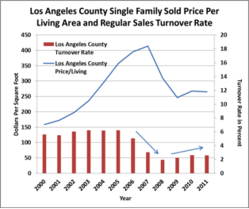 The relationship between Turnover Rate and sales price is highlighted with data from Los Angeles and Miami-Dade counties. The data shows that the Turnover Rate hits bottom 6 to 18 months before the bottom in home prices. In addition to sales activity, March’s HomeValueForecast.com also included a listing of the 10 best and 10 worst performing metros as ranked by our market condition ranking model. The rankings are run for the single family home markets in the top 200 CBSAs on a monthly basis to highlight the best and worst metros with regard to a number of leading real estate market based indicators, including: number of active listings, average listing price, number of sales, average active market time, average sold price, number of foreclosure sales and number of new listings. This month’s HomeValueForecast.com also shows that the bottom ranked metros include a number of areas which are still in the midst of price corrections from the 2000 to 2006 run-ups. At the same time, a number of these have experienced sizable declines in employment in the past several years. Highlighting HomeValueForecast.com’s belief that all real estate trends are local, March’s analysis also shows that even in Eugene-Springfield, Oregon, where home prices still may not have hit bottom, there are some submarkets and a particular ZIP code that is seeing positive trends. HomeValueForecast.com’s unique micro market data provides timely and comprehensive information on sales, listings, and off-market activity for 90% of the U.S. housing stock. This data enables Pro Teck to provide home price indexing, forecasting, and market analytics from a national, regional and ZIP/neighborhood level. For the full monthly update, check out http://www.HomeValueForecast.com. HomeValueForecast.com was created from a strategic partnership between Pro Teck Valuation Services and Collateral Analytics. HVF provides insight into the current and future state of the U.S. housing market, and delivers 14 market snapshot graphs from the top 30 CBSAs. Each month HomeValueForecast.com delivers a monthly briefing along with “Lessons from the Data,” an in-depth article based on trends unearthed in the data. HVF is built using numerous data sources including public records, local market MLS and general economic data. The top 750 CBSAs as well as data down to the ZIP code level for approximately 18,000 ZIPs are available with a corporate subscription to the service. To learn more about Home Value Forecast and Pro Teck’s full suite of residential real estate valuation products visit us at http://www.proteckservices.com.